Vampires are all the rage at the moment. Films, TV series, books, magazines, you name it, there's a sultry blood-sucker out there. And for theatre buffs, there's also a musical - Vampires Rock. The show is performed at Birmingham's New Alexandra Theatre on 15 November. Set in the Live and Let Die Club, the story revolves around Baron Von Rockula, who wants a new bride. Meanwhile, Pandora, a naive, young singer comes into the club looking to audition, which leads to the Baron attempting to teach Pandora the ways of 'Rock'. There's a multitude of rock anthems from Guns n Roses to Bon Jovi, AC/DC, Meat Loaf and Queen, along with vibrant costumes pyrotechnics and fake blood that make Twilight pale in comparison. 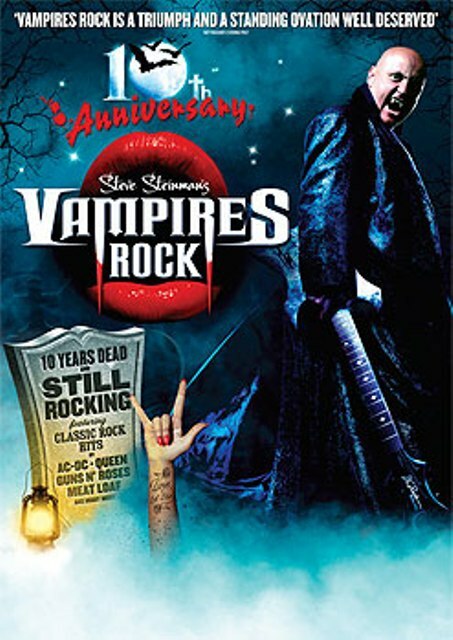 Vampires Rock was created by Steve Steinman, who leads the cast in the show. Steinman said: "The problem with a lot of musicals is that you have to see them a few times before you know the songs and can sing along, but the singing along is the fun part. "I wanted to create something where you could come to the show and be part of it from the very first time. "I wouldn't say Vampires Rock is a cult, but once you've been to see it you keep coming back - there's definitely a Vampires Rock Family. "There are people that travel all over to see us, there's even people with Baron Von Rockula and Pandora tattoos – that's the level of commitment the fans have."